Chen gains local, national recognition for creativity. You’ll have to excuse Amanda Chen if she’s not gloating about winning national recognition for her artistic talents. It’s just one of the things she does to keep busy. The 10th-grader at Cherry Hill High School East is fresh off receiving a silver medal in the national Scholastic Art & Writing Awards competition for excellence in crafting a drawing made strictly in pencil. A year ago, Amanda’s pencil-based artwork won a Scholastic Art & Writing national gold medal as well as an American Visions medal. That winning piece is on a two-year exhibit that will be displayed at various locations across the United States. 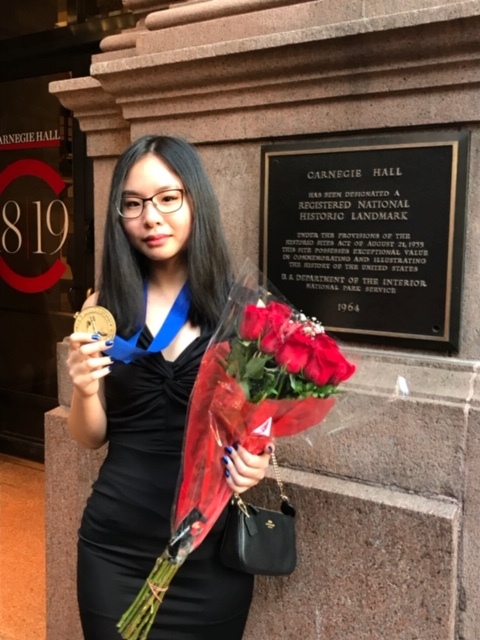 Honorees are gathered and feted at no less a venue than Carnegie Hall, an easy jaunt since the Scholastic Art & Writing Awards organization is headquartered a 10-minute subway ride away in Lower Manhattan. As the old saying goes, “How do you get to Carnegie Hall? Practice.” But for Chen, the path to this prestigious location began because of her success in regional competitions, taking home two regional golds and one regional silver last year for her art. As she related, at regional competitions, five pieces of writing and five works of art are selected by local judges as American Voices & Visions nominees, whose work is then displayed close to home. From that pool of 10 nominees, a panel of jurors in New York City will choose one writer and one artist from each region to receive an American Voices Medal or an American Visions Medal – as Amanda was quick to point out, these are two separate and distinct awards. The four who are ultimately chosen will go on to have their work celebrated displayed at a National Exhibition in Manhattan, and then the rest of the country. At a certain point in a young person’s life, the stress and pressure of growth requires the need for creative outlets. Amanda’s path appears to be no different from many others. It can be overwhelming at times, to have to deal with so much recognition so quickly for something one does for enjoyment. Amanda has recognized the need for artistic endeavors to play a role in the future, but she’s wisely not committed to what that means just yet. “I wouldn’t say I want to be a full-fledged artist when I grow up, but I want to have it be relevant in some kind of work. Like maybe designing or building,” Chen admitted. For more information on the Scholastic Art & Writing Awards, visit: https://www.artandwriting.org/what-we-do/the-awards/.